Composed by Daniel A. Walzer. Contemporary Classical, Jazz, World, Latin, Afro-Brazilian. Individual Part. 5 pages. Published by Daniel A. Walzer (S0.318109). 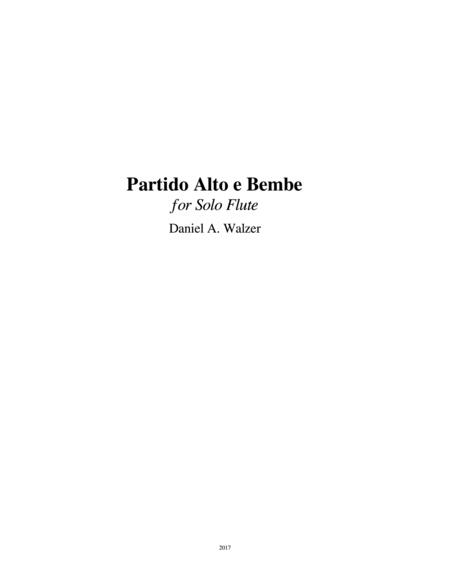 Written for Tammy Evans Yonce in 2017, Partido Alto e Bembe for Solo Flute is a composition that explores two ostinatos or repeating rhythmic patterns, drawn from Brazilian Samba and Afro-Cuban music. The Brazilian percussionist Airto Moreira popularized the Partido Alto rhythm (on a composition appropriately titled “Partido Alto”) on his 1979 album Touching You, Touching Me, with vocalist Flora Purim. 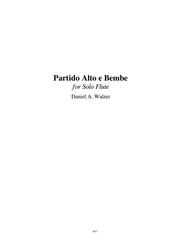 Partido Alto has a combination of accented and unaccented rhythms lasting two measures, which can be performed at varying tempos and include playful improvisation. Similarly, the Bembe feel has roots in Afro-Cuban music and is often performed alongside other polyrhythms simultaneously. As a jazz percussionist, I experienced these rhythms up close on two trips to Brazil in 2005 and 2008. I was struck by the dynamism, openness, and spirit of these rhythms—much like the Brazilian culture. In addition to the playful ostinatos, this piece features some jazz harmonic structures, varying time signatures, and lots of room for the performer to have fun and bring out the expressive qualities of the flute.